As the seasons change, so do palates. The snow is melting, the sun stays high in the sky and the many decks around Summit County are just inviting you to sit and sip for a while. The brewers in the area are getting ready for spring, too, creating beers that are perfect for post-ride recovery or leisurely afternoons of conversation and relaxation. Here are three styles to try this spring. 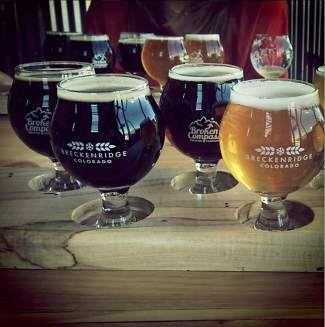 Some styles are classic summer sippers, like lighter Witbiers (an unfiltered Belgian style), Kölsch (a light, German style) and golden ales, like the Summerbright Ale from Breckenridge Brewery. These beers are always tasty and won’t leave you regretting it in the morning. However, if you’re looking for a new fling, here are three to try this spring. Perhaps one of the most iconic beers for the spring and summer is the saison. A “farmhouse” ale, the first saisons were brewed in France during the winter so that workers would have something to drink during and after a long day in the fields in the summer. Fruity in aroma and malty and spicy in flavor, a saison can be sessionable—but it also comes in a heavy-hitter variety. Dillon Dam Brewery is also offering up their Summit County Saison, an Imperial Saison that has a slightly lower ABV (7.8%), but still retains the spicy and smooth traits of a saison. With notes of clove, ginger and lemongrass, beer is a perfect spring-time sipper. Another Saison to try is the Pappy Legba, a Cerise Saison Regal, which will be tapped at Bakers Brewery in Silverthorne. At 13% ABV, the Pappy Legba is another beer to sip rather than slam. Another popular choice for spring is ginger beer. No, not the stuff that you make Moscow Mules with—beer that’s brewed with ginger. Breckenridge’s Broken Compass Brewery offers a Ginger Pale Ale that is smooth and refreshing for spring. The ginger flavor is subtle, not overpowering, and balances the clean, hoppy nature of the pale ale. At 5.6% ABV, it will quench a thirst without putting you down for the count. For another ginger beer to try, head to Après on Main Street in Breckenridge. Look for Left Hand Brewing’s Good Juju, which has hints of ginger and other spices and a low enough ABV (4.6) that you can try a few other beers as well. Après has a large selection of craft beer on tap that rotates often; you’re sure to find something to please your palate. Of course, not every spring beer has to be a light one; a dark-colored beer doesn’t necessarily mean that it’s a heavy one. Keep an eye out for Black IPAs, like Broken Compass’s version, or try one of the darker German styles of beer. Though malty and full-flavored, a dunkel is a good choice for spring as the temperatures can vary from minute to minute. Pug Ryan’s Deadeye Dunkel is one whose malt backbone stands straight with a nutty finish and not too much sweetness—it’s a combo of characteristics that is attractive in a beer as well as a drinking partner. For a traditional Munich-style version, head to Prost in Frisco, where they’ll pour you a Hofbräu Dunkel, an archetypal Bavarian beer that finishes with spice and caramel notes. Backcountry Brewery will soon release a collaboration beer that they brewed with Left Hand Brewery, a chocolate Weizenbock with cocoa nibs in it. At Bakers Brewery, Forster will soon tap another stash beer for the spring: a collaboration between Epic Brewing Company in Denver and Virginia’s Devils Backbone Brewing Company called Midnight Mischief. A “hopped-up schwarzbier,” the Midnight Mischief is a black lager with extra alcohol and a more hoppy profile. Of course, at the end of the day, the perfect spring beer comes down to two elements: what you’re in the mood for and what you have in your hand. So grab a pint and toast the spring—whatever your taste might be.